New Baby? Three Reasons why Now is the time to write or update your Will. 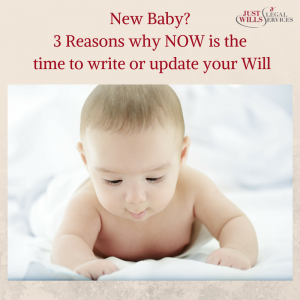 3 Reasons why Now is the time to write or update your Will. Starting a family is a big step, there is already a lot to think about when you are having your first baby, but there are some other important, less obvious, things you should be thinking about which you may not be. Nobody wants to think about their own death, and certainly not around the happy time of welcoming new life, but it is important to think about how your death would affect your new baby; who would like after your baby if you died? Would your baby’s future be provided for? If you already have a Will then now is a good time to update it, and if you don’t have one at all then it’s time to start looking and thinking about your estate plan. If you are married, but you don’t have a Will did you know that the first £250,000 of your estate will go to your spouse? Therefore, if your estate is worth less, then your children could get nothing. If you are living together, but unmarried and you don’t have a Will then your children are the first in line to inherit. The only exception being if a property is held in joint names and then this will pass to the other person in the title deeds. Single parents need to look at the circumstances of the childs other parent as well, if they have other children from another relationship, or a new spouse then your child may not inherit from the other parent if they die without a Will. As an unmarried single parent any inheritance you have will automatically be passed to your children (with the exception of any jointly owned property as above). However, if down the line you do get married it is important that your Will is updated as your new spouse will take priority for inheriting over your children. If you are a single parent, or if both you and your partner should die, then who would look after your children? It is easy to assume that a family member, or even multiple family members would step in, but wouldn’t you rather know for sure exactly who is going to look after your children, and that they are in agreement to do so? This could also save your family any potential disagreements on who is going to be guardian, I they are left to decide amongst themselves. This is a good time also to discuss any wishes you may have for how your children are raised if you are not around to raise them yourself. Have you left everything to your spouse, or you don’t have a Will as you are happy for everything to go to your spouse, safe in the knowledge that they will have the best interests of your children at heart? What happens if in the future your widowed spouse remarries? Well, if they don’t have a Will then your children could end up with nothing as the law favours the new spouse. Alternatively, they could be included in a new Will but not be looked after as you’d have hoped as circumstances change, your widowed spouse could have more children, as well as re-marrying. One way to ensure your children inherit exactly as you wish could be to look into a Trust.